Pra Delle Torri is a 4-star campsite offering superb facilities and luxury accommodation in one of the most scenic Italian regions. Enjoy a memorable luxury camping holiday in the vicinity of Venice and take this opportunity to explore the fascinating North East of Italy. Contact the luxury camping experts at Lux-Camp and we will help you book an unforgettable camping holiday in Italy. The price is for 5 people. There is an extra charge for the 6th/7th person to be paid on site. Children aged 3-5 years cost between €5 - €8,20 per night. Children aged 6-11 years cost between €4 - €9,40 per night. People aged 12-65 years cost between €5,40 - €11,70 per night. People from 65 years cost between €5 - €10,40 per night. Please note that prices are indicative. PLEASE NOTE : All guests must present a valid identity card or passport at the reception upon arrival at the reception desk. This is independent of the age of the traveller. Why should I camp at Pra Delle Torri? Enjoy luxury camping at its best with the superb range of accommodation options available at Pra Delle Torri. This exceptional camping site offers modern, comfortable, and fully equipped accommodation in bungalow tents, mobile homes, and spacious apartments that can accommodate couples, families with children, and large groups. Stay near Venice in style by booking a luxury tent or a swanky bungalow and enjoy every comfort on offer, including private outdoor areas, luxurious bathrooms, bright and airy bedrooms and living space, and more. Why should I camp in Pra Delle Torri? This luxury camping site offers a wide variety of fully equipped accommodation options. The site enjoys an ideal location just over 2 hours away from Venice, 1 hour away from Treviso, and within easy reach of the most splendid beaches of the Adriatic Sea. Fantastic leisure and entertainment facilities to suit all interests and age groups. This is an award-winning luxury campsite that has been listed as one of the best campsites of 2015 and that continues to receive excellent reviews. Whatever your heart desires, you will find it in the vicinity of Pra Delle Torri. Plenty of cycling and hiking trails await you, or of you prefer it, you may go for a round of golf at the campsite's golf course, which features 18 holes and a challenging layout. Other activities include swimming, taking trips to nearby islands, bowling, beach volley, archery, etc. 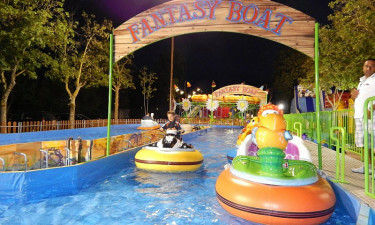 An activity park is available at the campsite to keep the younger ones entertained all day long. Thanks to its exceptional location on the shores of the Adriatic Sea, Pra Delle Torri is the ideal base for anyone looking to enjoy a relaxing holiday surrounded by impressive natural landscapes. 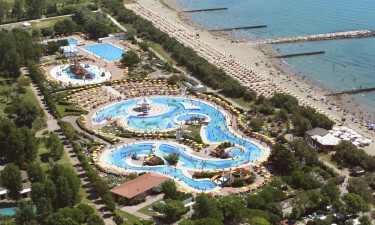 The campsite is within walking distance of Caorle, a beautiful coastal town that is known as the Pearl of the Adriatic thanks to its low-key atmosphere and expansive sea views. Further east you will find lush valleys, picturesque lakes, and quaint fishing villages, as well as first-class birdwatching sites, isolated beaches, and the iconic Venetian lagoons. Pra Delle Torri is home to four restaurants where guests will be able to discover the impressive culinary offer of Northern Italy. 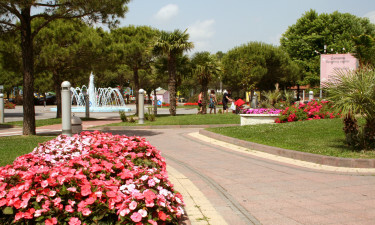 Among the restaurants you will find a pizzeria that's perfect for informal meals, a glamorous restaurant located near the golf course club house that serves traditional Italian dishes, a cosy restaurant serving contemporary cuisine, and a self-service restaurant open for breakfast, lunch, and dinner. 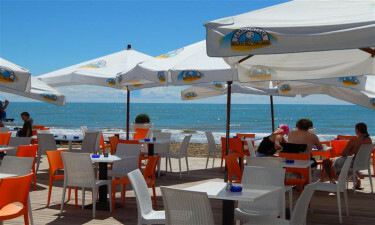 A trendy beach bar serving snacks and grilled meat dishes is also on-site.